Without so much as a flinch, SpaceX sent the CRS-12 Dragon cargo spacecraft off to the International Space Station. Liftoff took place at 12:31 p.m. EDT (16:31 GMT) on August 14, 2017, within its one-second “instantaneous” launch window. This flight is poised to deliver more than 6,400 pounds (2,900 kilograms) worth of equipment and supplies to the orbiting outpost in the next 36 hours. The weather was nearly perfect for launch, with the 45th Space Wing predicting an 80 percent chance of favorable conditions. SpaceX’s Falcon 9 rocket lifted off from Launch Complex 39A, the former Space Shuttle launch pad. The bright orange flame of its nine-engine first stage thrusted out and over the Atlantic coast with the familiar crackling roar diminishing after about a minute as the launch vehicle carried its cargo out of sight. The first stage powered through max-Q (maximum dynamic pressure) just over a minute later, followed by main engine cutoff at around 2 minutes, 25 seconds after leaving Florida. Within the span of several seconds, the first stage separated from the second stage, the second stage’s Merlin Vacuum ignited to continue propelling it and the capsule toward orbit, and the first stage flipped around and performed a boostback burn to send itself back toward Florida. Heading back to Cape Canaveral Air Force Station’s Landing Zone 1, the first stage, core 1039, performed several maneuvers over about five minutes. After the boostback burn, the vehicle reoriented itself with the engines facing toward its direction of travel. Then, four grid fins attached to the interstage deployed to help guide the 160-foot (50-meter) tall first stage through the atmosphere. About 6 minutes, 9 seconds after leaving Florida, the first stage performed an entry burn to ease itself through the atmosphere. This 10-second burn was followed by the landing burn just over a minute later. Seven minutes, 43 seconds after taking flight, the first stage came to a soft landing at LZ-1. It was the 14th time SpaceX had recovered a Falcon 9’s first stage. Six of those recoveries have been at LZ-1 while the other eight have been at sea. Meanwhile, the second stage, with the Dragon capsule on top, continued toward its initial orbit. About 9 minutes, 14 seconds after leaving Florida, the lone Merlin Vacuum engine cut off. One minute later, the Dragon capsule separated from the second stage and deployed its twin solar panels some 45 seconds later. The capsule will now spend the next two days catching up with the ISS. It is expected to rendezvous with the outpost on August 16. It will be captured by the robotic Canadarm2, which will be controlled by Expedition 53 crew members Jack Fischer of NASA and Paolo Nespoli of the European Space Agency. Dragon will then be moved to the Earth-facing port of the Harmony module where it will be berthed for about a month while the crew unloads the vehicle and then reloads it for a return to Earth. The spacecraft used for the CRS-12 mission is the last new first-generation Dragon to fly. SpaceX plans to use reflown, refurbished Dragon spacecraft until the cargo version of Dragon 2 becomes available. Dragon 2 will fly first with crew sometime in 2018. SpaceX’s next Falcon 9 launch is currently expected on August 24. The FormosaSat-5 mission will fly from Vandenberg Air Force Base in California. The next SpaceX launch from Kennedy Space Center will send the Air Force’s secretive X-37B spacecraft into space. This will be the first time the spaceplane has launched atop a Falcon 9, with the previous four launching atop Atlas V rockets. Liftoff for the OTV-5 mission currently expected on September 7. As for cargo missions, the next one, CRS-13, is slated for sometime in December 2017, according to SpaceX officials. The company is currently under a contract to send 20 missions to the outpost, which should be completed no earlier than 2019. A follow-up contract calls for at least six more cargo delivery missions. The CRS-12 launch marks a busy period both for the Cape and for NASA, just four days from now, August 18, Colorado-based United Launch Alliance is planning to send a mission into space on behalf of the U.S. space agency. A Tracking and Data Relay System satellite will be sent into a geostationary transfer orbit atop an Atlas V rocket. While NASA might be having a busy week, SpaceX is having a very busy year. 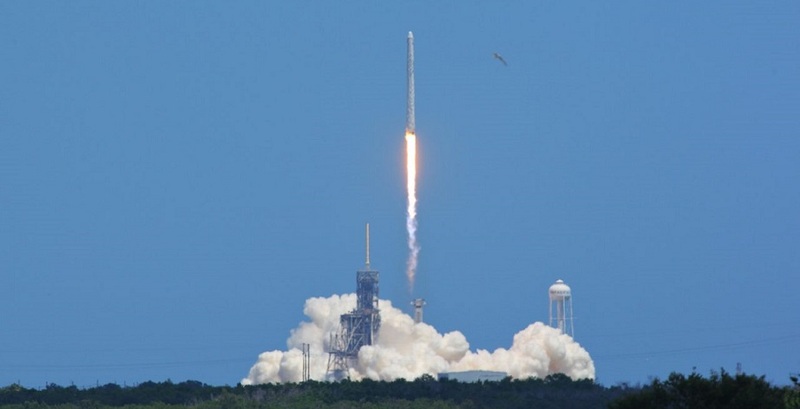 CRS-12 was the 11th launch the company has carried out in 2017. Nine more are planned before the end of the year, including the maiden flight of the long-delayed Falcon Heavy rocket.